President Donald Trump now finds himself, not even two years into his term, besieged by congressional opponents, a special investigator, numerous lawyers, the mainstream media, protesters in the street, and even anonymous critics within his own administration. Many of these opponents hope that the president will resign, be impeached, or be rendered politically impotent by proof that Trump’s team colluded with Russia to win the 2016 election. Craig Unger, a reporter who has written about Trump’s ties to Russia for such outlets as The New Republic, promises to help build this case. 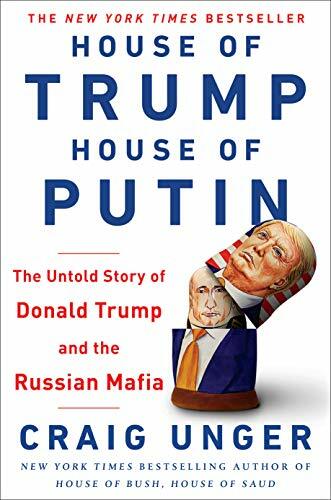 His latest book, House of Trump, House of Putin, brings together much of what he has already published on the topic. It’s a useful compendium for readers who have not been zealously following the issue. Unfortunately, it doesn’t break any new ground. And the book is marred by unnecessary speculation and unsupportable conclusions. In his article “Trump’s Russian Laundromat” in the July 13, 2017, issue of The New Republic, Unger lays out most of the story. Donald Trump, a New York real estate mogul, cultivated his connections to figures in the Russian underworld going back to the 1980s. These criminal types bought units in his apartment buildings and gambled in his casinos. In 1987, federal authorities ultimately charged one of those figures, David Bogatin, with buying five condos in Trump Tower as part of his efforts to launder money generated by his various criminal enterprises. In House of Trump, House of Putin, Unger digs deeper into the Russian underworld to show how Bogatin and a colorful cast of Russian billionaires, mafia bosses, intelligence officers, and others have worked with Trump over the years on business ventures, beauty pageants, and ultimately a presidential campaign. They provided him with cash when his businesses were failing. They gave him, through licensing deals, a way to rehabilitate his brand. But Unger fails to demonstrate the final link: between the Russians and Trump’s presidential ambitions. He builds a strong case for Trump’s connections to Russia and a case for Russian influence on the U.S. elections. He doesn’t, however, convincingly connect the two. It’s not difficult to prove that Donald Trump is ignorant and unaware. It’s also not difficult to show how Trump has bent over backward to cultivate a relationship with Russian President Vladimir Putin and other powerful Russian figures. It’s considerably more difficult to demonstrate that he is a Russian asset. Unger essentially relies on two reports. The first, a classified Czech secret police report from October 1988 that noted that Trump was being pressured to run for president. It doesn’t say by whom. Unger raises the possibility that even back then, more than a decade before Putin became Russia’s president, the Kremlin had compromising information about Trump. But there’s absolutely no evidence of this. The second report is the infamous Steele dossier, which alleged that Trump was providing intelligence to Putin on “activities of business oligarchs and their families’ activities and assets in the United States.” This is more likely, given Trump’s propensity to talk freely about his connections. But again, Unger supplies no proof for this assertion. Strangely, in making his case that Trump is a Russian asset, Unger doesn’t even mention the one clear case when Trump, as president, gave valuable information to a Russian contact. On May 17, 2017, in a meeting with Russian Foreign Minister Sergey Lavrov and Ambassador to the United States Sergey Kislyak, Trump provided classified information about an Israeli spy in Syria. Another strange gap in the book is Trump’s relationship to Deutsche Bank. Because of his frequent inability (or simply his refusal) to pay back loans, most commercial banks wouldn’t touch Donald Trump. The exception was Deutsche Bank, which at one point even loaned Trump money to pay back another Deutsche Bank loan. This might ordinarily be just an example of financial stupidity if it weren’t for another development. Last year, Deutsche Bank was fined over $600 million for its role in laundering Russian currency. Unger doesn’t explore this very intriguing connection. There are reasons perhaps for Unger to skip these stories. His account stops with Trump winning the presidential election in 2016. And Luke Harding covers the Deutsche Bank angle in his book Collusion. Still, House of Trump, House of Putin levels some serious charges against Trump without marshaling all of the necessary evidence. Finally, Unger seems out of his depth when venturing beyond the central themes of this book. Take, for example, his discussion of Eastern Europe. In a section about Viktor Orban, Unger tries to argue that the Hungarian leader did a 180-degree shift to become one of Putin’s major allies in Europe because of a payoff in 1994 and Russian possession of evidence to that effect. But there’s only one source for that information, a former German bank robber, and he’s hardly reliable. Moreover, Unger doesn’t take into account the ideological reasons for Orban’s about-face—that the Hungarian leader genuinely embraces Putin’s illiberalism with its religious, anti-Western overtones and has been looking for a way to balance EU influence. Then there’s Unger’s assertion that Poland’s Law and Justice Party is “pro-Russian.” That, of course, is nonsense. It’s a right-wing nationalist party that is deeply suspicious of Russia. And Unger’s suggestion that Russian involvement in Syria was somehow about triggering an outflow of immigrants to undermine the EU and bolster anti-immigration sentiment is similarly off base. In his concluding chapter, Unger ends up falling back on conjecture. The Russian mafia “possibly” used Trump real estate to launder money. Russian authorities “most likely” had some compromising information on Trump. It was “more than likely” that Russian interference tipped the election in Trump’s favor. Really? This is all you got? House of Trump, House of Putin has a good deal of useful information in it, particularly on Russian mobsters and oligarchs working their way into the worlds of U.S. finance and politics. It shows how a number of U.S. political figures—Trent Lott, John Breaux, Louis Freeh—have worked on behalf of powerful Russian syndicates. It describes Vladimir Putin’s connections to the Russian mob as well as myriad terrifying methods he has used to maintain power. The book is certainly worth reading for these passages. But Unger fails to deliver on his initial promise: proving that Donald Trump is the result of one of the greatest intelligence operation in history. Perhaps if he continues to follow the story, and gets a big assist from Robert Mueller and future congressional inquiries, Unger will get to the bottom of it. John Feffer's books include the forthcoming dystopian novel Frostlands (Haymarket Books, 2018). His most recent nonfiction book is Aftershock: A Journey into Eastern Europe’s Broken Dreams (Zed Books, 2017). He is Director of Foreign Policy in Focus at the Institute for Policy Studies.